The Droplet Pillar Merger Chip (200 µm etch depth), hydrophobic is a glass microfluidic device designed for continuous merging in a controlled manner of two droplets with different composition. It features an in-line merging chamber mechanism allowing two-at-a-time droplet merging between reference library samples and the test solution. The resulting merged droplets are stable and can be collected off- chip for further manipulations or analysis. Additionally, this chip is ideal for integration with Dolomite`s Mitos Dropix System to create infinite droplet combinatorial reactions. The Droplet Pillar Merger Chip (200 µm etch depth), fluorophilic is a glass microfluidic device designed for continuous merging in a controlled manner of two droplets with different composition. It features an in-line merging chamber mechanism allowing two-at-a-time droplet merging between reference library samples and the test solution. The resulting merged droplets are stable and can be collected off-chip for further manipulations or analysis. Additionally, this chip is ideal for integration with Dolomite`s Mitos Dropix System to create infinite droplet combinatorial reactions. 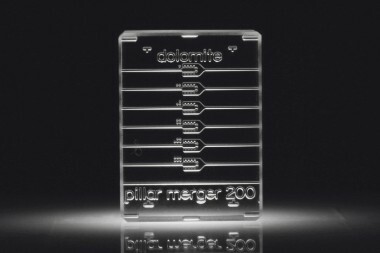 The Droplet Pillar Merger Chip (200 µm etch depth), hydrophilic is a glass microfluidic device designed for continuous merging in a controlled manner of two droplets with different composition. Droplet Pillar Merger Chip, hydrophilic (200 µm etch depth) allows oil droplets to be created in water. Other options include aqueous droplets created in an organic carrier phase using the Droplet Pillar Merger Chip, hydrophobic (200 µm etch depth), or aqueous droplets in fluorinated oil using the Droplet Pillar Merger Chip, Fluorophilic (200 µm etch depth).